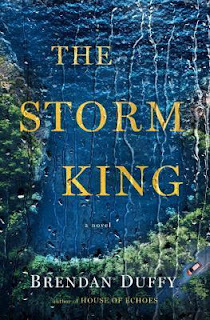 I am currently well into Brendan Duffy's The Storm King and quite enjoying it. With rain beating against my house, the winds blowing, and threats of flash floods, it seems a fitting novel to be reading right now. It's about a man who returns to the small lake town he grew up in after a long absence for a funeral. His presence and the massive hurricane that is hitting the town stir up old memories and hurts. This is a haunting book in it's own way. I imagine I will be finishing it in the next day or so, and although I have my suspicions about some of what hasn't yet been revealed, I am anxious to find out if I am even close to the mark. For Nate, Saturdays in the spring means baseball. His teammates think playing the outfield is ignominious, but he likes it. There's a meditative appeal to a morning spent watching for hard-struck balls as they spin and slow at the height of their parabolas. My thoughts: It does not seem as if there is anything particularly revealing about this thriller from the opening paragraphs. It's a meaningful moment though in Nate's life. My thoughts: This was quite a tense scene in the novel. This teaser doesn't reveal who "he" is, although it's pretty clear who it is to the reader reading the novel. I wouldn't want to be on the receiving end of that look, that's for sure! 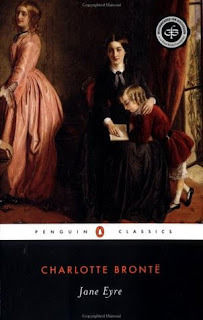 Jane Eyre by Charlotte Brontë ~ One of the few books I have read over and over again. And I love it each and every time. I may not think Rochester is all that, but I do love Jane and everything about this novel. Brave New Word by Aldous Huxley ~ It took several attempts, but I finally got through this one last year. I see why it is a classic, but I was not impressed when all was said and done. What is your favorite and least favorite classic? I totally agree with you. Even though the quote was short, there's a lot of obvious tension between the characters. Now I'm curious about what led up to that scene. Breana - I am really enjoyed the book so far. I'm dying to know how it is all going to turn out. Thanks for stopping by, Breana! I'm thinking the same, what happened? Very intriguing! I don't think I've ever read either of those classics. My favorite classic is Little Women - I'm not sure about my least favorite. The cover of this is gorgeous and I do love the teasers. That 56 is definitely intense and I like the character description in the beginning even though it's not the usual beginning for a thriller. Katherine - I love the cover too. This is turning out to be the perfect read with the weather we've been having. This does sound good. The beginning doesn't even hint at "thriller" though. I'm featuring Falling Star by Terri Osburn - a romance from my review stack - this week. Happy reading! Kathy - Yeah, you would never know if you went by just that opening it's a thriller. It's a good one though. I hope you have a good weekend. I am planning on reading The Storm King and so I was glad to read the teasers you shared. The second one with the 'smile like a wolf' - alrighty then - think I'll be watching for 'he'. Ha! Classics - OK, I'll confess it right now - I'm not going to be finishing my Classics Club Spin book - The Woman in White. At least not by April 30th. I've fallen asleep 4 times trying to read it. And I tried to listen to it - nope, it's not working. Maybe another time. I'll likely listen to another Christie book as a substitute and get to TWIW later. Favorite - SENSE AND SENSIBILITY (of the regular classics). Most unfavorite - anything by William Faulkner. Kay - I hope you enjoy The Storm King when you read it, Kay. I'm sorry you aren't enjoyed The Woman in White. It's one of my favorites. Christie is always good. :-) I have not read Sense and Sensibility yet--but I have loved the other Austen books I have read. I felt pretty much the same way about Brave New World. It's one of those books that you're glad you read because it is really well written, but you hated it at the same time. I also felt like that with 1984 :) I was actually thinking of rereading Jane Eyre soon because it's been a while since I've read it and I keep seeing some of my favorite quotes from it around the blogosphere! Thanks for linking up, Wendy! Laura - I am glad I am not alone when it comes to not liking Brave New World. It's referenced so much in our society, that it is nice to have read it, but I won't be reading it again. I hope you enjoy Jane Eyre when you re-read it! Sounds like a fantastic read! Happy weekend! Freda - I am enjoying it. :-) I hope you have a good weekend too! Hope you'll continue enjoying your new read. Nicki - I hope so too! Thanks for stopping by. I hope to get to The Storm King soon. It sounds like such a good book. I am not a classics reader at all. I did listen to The Wizard of Oz and enjoyed it but I don't usually have much luck with them. Carole - I hope you enjoy it! I hope to finish it this weekend if I can drum up some decent reading time . . . I haven't read The Wizard of Oz, but I might give it a try. Listening to it is a good idea. I've not read The Storm King which sounds interesting. The 56 is full of emotion and intensity....I like it! Thanks for sharing, and for visiting my blog. Enjoy your weekend. Jo-Ann - Isn't it?! I hope you have a great weekend too! Jane Eyre is one of my favorites too. It's just a wonderful classic novel. Carrie - Yes, I agree. :-) Thanks for stopping by, Carrie! Hope you've a great weekend, Wendy! The Storm King sounds very good, I requested that one via AmazonVine last year and the package arrived, empty and torn so I never got the book. I need to read Jane Eyre, I've heard nothing but good things. My fav classics are Withering Heights and Pride and Prejudice. I wasn't a great fan of Brave New World either. I read it once but don't ever see myself reading it again. Jane Eyre is one of my favorites too, along with Pride and Prejudice. Jane Eyre is fantastic. I haven't tried Brave New World, though... one of these days! Lauren - If you do read Brave New World, I hope you like it better than I did!